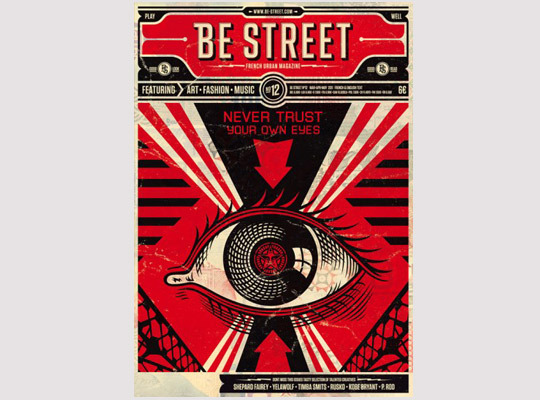 French magazine Be Street is about to release their issue 12. 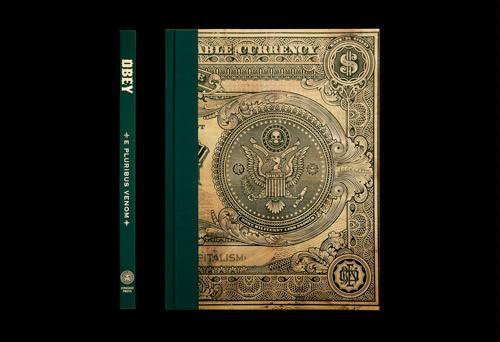 This time they have commissioned artist Shepard Fairey to do the cover design. Next to Shepard Fairey the new issue also features Johnny Cupcakes, Rusko, Yelawolf, P-Rod and lots of other interesting personalities, next to the latest in style and fashion. Having his Obey campaign spawning everything from a clothing line, record label and even presidential endorsements in less than a decade, Shepard Fairey’s accomplishments are nothing short of extraordinary. In his latest book titled E Pluribus Venom, Fairey features works from his 2007 show at the Jonathan Levin Gallery in New York City. The signature political propaganda artworks spread over 140 pages, filled with the usual red, black and tan color schemes. E Pluribus Venom is now available at Turntable Lab, with each copy personally signed by the man himself. French street art provocateur BLEK LE RAT inaugurated modern street art messiah SHEPARD FAIREY’s newly relocated (and visually stunning) SUBLIMINAL PROJECTS gallery in Echo Park this weekend with his first American solo show, “Art is not Peace but War.” A groundbreaking graffiti writer in the 1980s & 90s, Blek is best known as one of the earliest pioneers of stencil art and his simple monochromatic iconography heavily influenced the street artists from the Bristol scene, most notable of which is the current art star du jour and cash register tickler, Sir Banksy, who adopted not only Blek’s stylistic M.O., but his rat mascot as well. Looking at Blek’s simple, understated imagery, which remains largely unchanged since his early days on the walls of Paris, it’s not hard to see the immediate appeal of the stencil as a graphic tool for street bombing situations and Banksy’s adoption of the once rarified method exploded its popularity within a matter of years spawning a legion of young imitators and monied collectors. With pieces selling briskly at prices ranging from $9,000–$40,000 for original spraypaint on canvas works and a queue of young punters, hipsters, and would-be street art stars wrapping around the block for the better part of the opening nite, it’s clear that the medium’s appeal shows no signs of waning. Across the pond for the past several weeks to prepare for his massive upcoming show, “NineteenEightyFouria,” set to debut this Friday nite at STOLEN SPACE in London. If you are in the neighberhood check out all the work that has been done around! It is cool! For further information, check out my previous post. 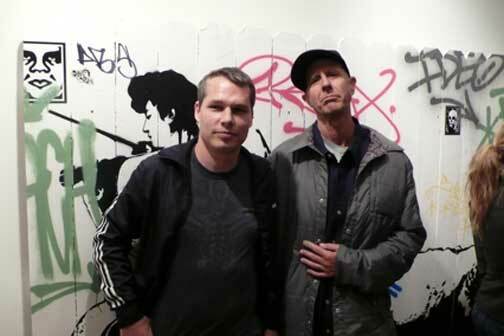 Many regard Shepard Fairey as one of the godfathers of the modern urban art scene and he’s widely known as one of the hardest working men in the business. His Obey Andre the Giant figure can be found all over the world, oftentimes in some surprising locales. Unique stencil, collage, photography and painting techniques have made him possibly the worlds most well-known street artist. Fairey’s latest venture is taking on the art world as he continues to move his pieces into gallery environments. For those of you who missed the show in New York City you’ll have a chance to view his work across the pond in London 1-25 November 2007 at Stolenspace. 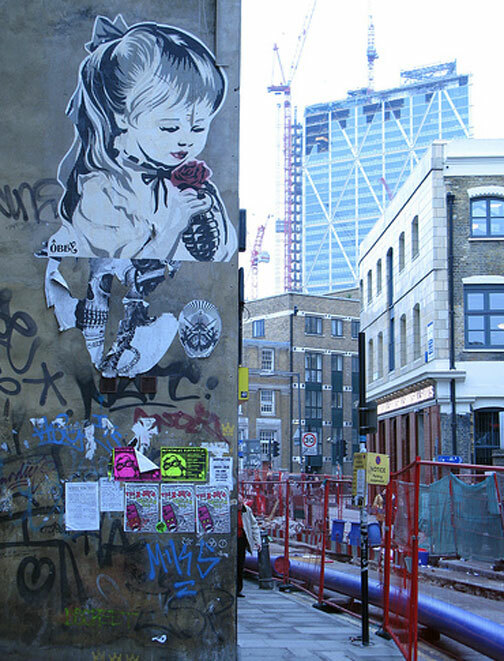 Named “Nineteeneightyphoria“, it’s his inaugural show in London, arguably the street art capital of the world. Comprised of a range of artworks, mostly awesome in scale, it’s an overt reference to the surveillance culture of Orwell’s 1984 and where better than just under the Eye and Big Ben. Fairey harnesses his counter culture reputation to question the cultural paradigm post 9-11. Opening Reception Thursday, 1 November 2007, 6:30-9:30pm. On view from 2 – 25 November 2007, at the Stolen Space Gallery.